1 On the twenty-second day of the first month in the eighteenth year of his reign, there was talk in the House of Nebuchadnezzar, king of the Assyrians, of punishing all those who had disobeyed the king’s commands. 2 He called together his ministers and his noblemen, and told them his secret plan. 3 He proclaimed publicly the total destruction of the land and the punishment of all those who had disregarded his call. 5 “So says the Great King, Lord of all the earth, you will set out from my presence, taking with you men of true courage, about one hundred and twenty thousand foot soldiers and a great number of horses with about twelve thousand cavalrymen. 6 You will go to all the countries in the West and punish all the peoples, because they disregarded my orders. 7 Tell them to submit themselves to me on land and water, lest in my anger I myself march against them. I will cover all the face of the earth with the footprints of my army, and I will give them over to my men to be plundered by them. 8 The ravines will be filled with their wounded, rivers and torrents will be full of their dead. 9 I will lead away their prisoners as captives to the uttermost parts of the earth. 10 Go, then, and occupy in my name all their territories; if they surrender to you, keep them for me that I may punish them. 11 Show no pity to those who resist you. Hand them over to be massacred and plundered throughout all their lands. 12 For, as truly as I live and by the power of my kingdom, I will carry out with my own hands what I have said. 14 Holofernes went out from the presence of his lord and called together all the chiefs of staff, the generals and commanders of the army of Assyria. 15 He gathered about a hundred and twenty thousand specially chosen men for the army as his lord had ordered him, and twelve thousand archers. 16 He arranged them in battle positions. 17 He took along camels, donkeys and mules to carry the baggage, and a great number of sheep, oxen, and goats for their food. 18 He took a sufficient quantity of provisions for each man, and an abundant supply of gold and silver from the king’s treasury. 19 Then Holofernes set out on the march with all his army, with their chariots, cavalry and picked foot soldiers going ahead of King Nebuchadnezzar to cover all the lands to the West with this army. 20 They were accompanied by a great crowd of people, so many were they that they were like locusts or the dust of the earth. 21 After marching for three days from Nineveh, Holofernes and his men reached the plain of Bectileth where they encamped before the city, near the mountains to the north of Upper Cilicia. 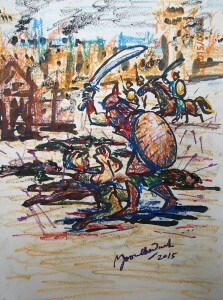 22 Then Holofernes took all his army, foot soldiers, cavalry and chariots, and marched into the mountain region. 23 He utterly destroyed Put and Lud, and plundered all the land of Rassis and of Ishmael on the border of the desert to the south of the country of the Chaldeans. 24 Then he followed the Euphrates, crossed Mesopotamia and destroyed all the cities high above the torrent of Abron until he reached the sea. 25 He took possession of the land of Cilicia, and cut down all who opposed him, and arrived at the land of Japheth in the south toward Arabia. 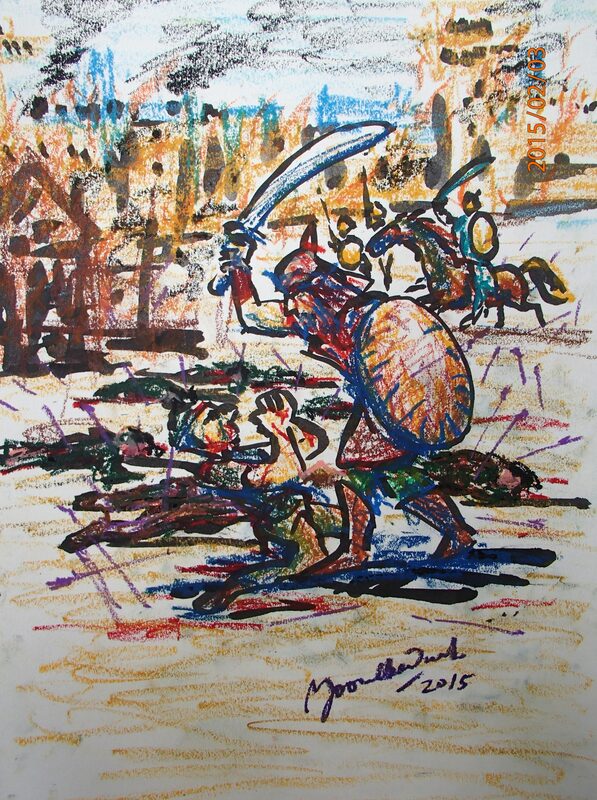 26 He surrounded all the children of Midian, burned their tents and destroyed their livestock. 27 Then descending to the plain of Damascus at the time of the wheat harvest, he burned all their fields, scattered all their animals and killed the young ones, pillaged their villages, devastated their plains, and put all their young men to the sword. 28 The fear and terror of him fell upon all the inhabitants of the seacoast, those in Tyre and Sidon, in Sur, Ocina and Jamnia. The people of Azotus and Ascalon also feared him.